Epitope mapping is a method for identifying antibody-binding sites on an antigen, but can also be expanded for use in other protein-protein interactions, such as receptor-ligand interactions. In the immune response, groups of amino acid residues that lie close together on the protein surface form B-cell epitopes determining protein antigenicity. In most cases, epitope mapping is performed with monoclonal antibodies (mAbs). Determining the specific antigen binding regions or epitopes of an antibody benefits not only antibody based testing platforms, but also their therapeutic applications, development of vaccines, study of protein interactions, auto-immune diseases, etc. Cloning and expression of the different regions of target genes and purifying the recombinant truncated proteins is the conventional method to map the antigen epitopes. However, this process is time-consuming and some recombinant proteins are difficult to purify. The chemical synthesis of overlapping peptides is simple, fast, and low-cost. Printing these synthetic peptides on a solid support to prepare a high density peptide array is well-developed technique used by RayBiotech. 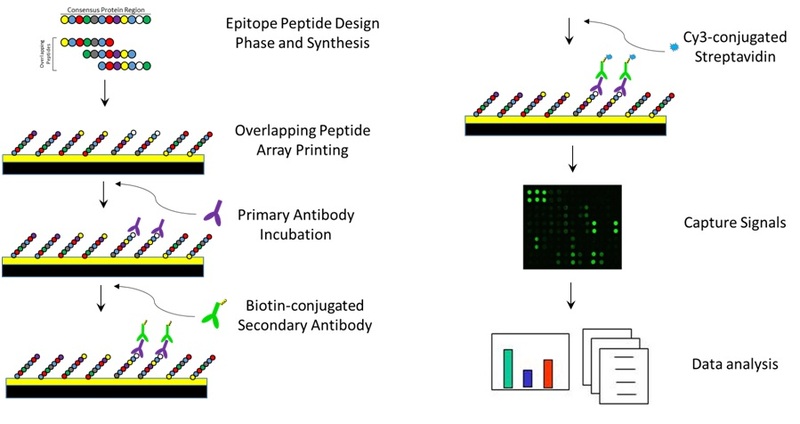 Therefore, peptide arrays could be a powerful tool to map epitopes for antibodies, as well as potential protein-protein interactions. Our technical support team has significant experience in diverse biological fields (immunology, virology, neurology, microbiology, etc.). Please contact our array experts with your project of interest. We look forward to discussing your ideas, answering questions, and helping you design a tailored polypeptide array for your epitope discovery needs. simply fill out a quote request form linked below or email our ordering department (orders@raybiotech.com). They will email you back a formal quote as soon as possible. The process of mapping the potential epitopes in a target protein begins with preparing the peptide arrays. Based on each customer’s requirements, we will design a tailored strategy of synthesizing overlapping polypeptides that fit their needs (Figure 1). The polypeptides will then be arrayed on glass slides in triplicates, along with the negative controls (for example, non-related random peptides) and positive controls (whole proteins, if available). After blocking the array, the overlapping peptide arrays are sequentially incubated with the primary antibodies against the target protein and an appropriate biotin-conjugated secondary antibody against human, mouse, rat, etc. (depending on the animal source and isotypes of the primary antibody). After comprehensive wash steps, the antibodies bound to the epitopes are detected by fluorescent Cy3 dye-conjugated streptavidin. The fluorescence of each peptide spot is then captured by laser scanner and the potential positive epitopes with strong signal will be further evaluated (Figure 1). Figure 1. Linear epitope mapping service procedure using the RayBio® Overlapping Peptide Array. The synthesized polypeptides are printed on glass slides in triplicates. After blocking, peptide arrays are sequentially incubated with antibody against target of interest, biotin-conjugated secondary antibody, and Cy3-conjugated streptavidin. The fluorescence signal of each epitope is captured by a laser scanner and data is analyzed with our analysis software. High density peptide arrays are a fast and effective way to quickly screen hundreds to thousands of overlapping peptides simultaneously. RayBiotech, Inc. is the pioneer of the protein array platform, and provides this comprehensive array service to our customers world-wide. Our array experts will help you design your experiments and customize your peptide array. There are many ways to design the overlapping epitopes. See Figure 2 for examples. RayBiotech provides high purity (>95%) desalted polypeptides in amounts ranging from micrograms (µg) to milligrams (mg). RayBiotech’s state-of-art arrayer will print the polypeptides on a glass slide solid support. Multiple formats (2, 4, 6, 8, or 16 arrays per slide, depending on peptide library sizes) can be provided per your experimental needs. RayBiotech’s array service team will perform the peptide array tests with your specific antibody or target protein. In addition, RayBiotech will also provide kit components to you so that you can perform your own array tests if needed. After array scanning, fluorescence intensities are extracted, normalized, and analyzed according to our standard procedures. The specific binding of each epitope is evaluated per our analysis software. Figure 2. Schematic representation of typical strategies of designing overlapping polypeptides for epitope discovery. 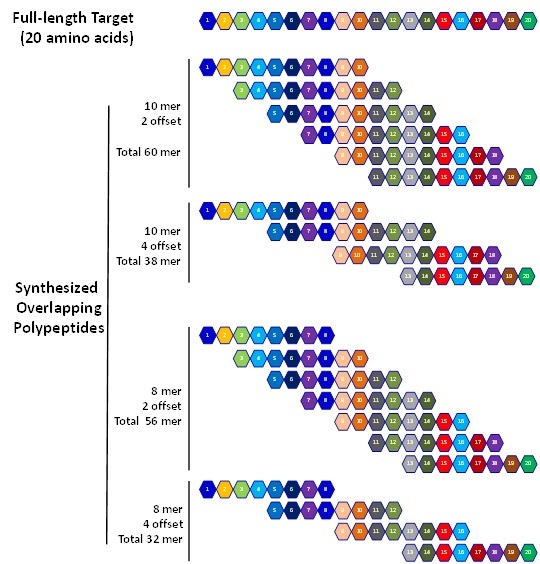 For a protein target with 20 amino acids (for example), the synthetic peptide length (mer) and offset residue numbers will determine the overlapping residue numbers and peptide array sizes. For example, if the synthesized polypeptides are 10 mers, one would need to synthesize 6 polypeptides with 2 residue offset or 4 polypeptides with 4 residue offsets. Just submit your protein sequence along with the antibody or serum, and RayBiotech will deliver a data report with array test result, the residue sequences of positive epitopes, etc. Hundreds to thousands of overlapping epitopes can be screened in a single array simultaneously. Tailor a custom peptide array for each unique project as needed. As little as a few microliters (µl) of antibody is required per array. Biotin-streptavidin pairing combined with fluorescent detection provides the most sensitive assay available to measure each epitope signal. Using a cy3 fluorescent signal, a wide detection range (4 orders of magnitude) is possible. All techniques involved are developed at RayBiotech and all services are performed in-house. Through peptide array screening, the antigenic epitopes eliciting the antibody of interest can be identified. The results allow for the regeneration of the antibody using the identified epitope alone in order to minimize cross-reactions resulting from using the whole protein as an immunogen. Thanks to their exquisite specificity and pharmacokinetic properties, monoclonal antibodies and their single chain variable fragment (scFv) derivatives have been increasingly exploited as therapeutic drugs. The peptide array offers a powerful, efficient, tool for gaining insight into the therapeutic mechanism of action, cross-reactivity to other species, and potentially, binding properties to naturally occurring variants of the antigen. Using epitopes identified by the peptide array, future immunizations can target a defined antigenic region to limit potential cross-reactivity in vivo. In monoclonal antibody generation, a panel of antibodies needs to be characterized in specificity and binding affinity to target. Selected clones can be easily applied to our peptide epitope arrays to simultaneously discover their epitopes and compare their binding affinities and specificities. This information helps the researcher select the best antibody for further studies. Some antibodies can recognize the same proteins derived from different species, often due to significant sequence similarity within the antigen of interest. Determining the exact epitope of the target antibody with our peptide arrays can facilitate the determination of cross-species reactivity. Once the antibody epitope was identified, amino acid substitutions or mutations can uncover the essential amino acid(s) for epitope specificity, or identify protein-protein interaction binding site(s). This could lead to advances in limitation of antibody cross-reactivity in vivo which can limit autoimmune responses to monoclonal therapies, or identify antibodies with higher affinity in vivo. Auto-antibodies attack normal cells and cause the damage from direct lysis, cytokine associated cell death, or block normal cellular signaling/functional pathways. Our peptide mapping arrays can help to locate the auto-antigen epitope region binding to auto-antibodies, which could lead to development of antagonistic epitopes that reduce a patient’s autoimmune disease response. The interaction between human IgE antibodies and allergens is a key event in triggering an allergic reaction. Allergen overlapping peptide arrays can help identify allergen epitopes which bind to allergen specific IgE present in patient sera. The characterization of allergen epitopes provides information for allergy diagnosis as well as subsequent desensitization. For example, using small dose of identified epitopes derived from allergen protein array may be more useful in desensitization treatment compared to using the whole protein. Epitope Mapping Service Results One monoclonal antibody (mAb) against a mouse protein (approximately 3,000 amino acids in length) was generated using a 28-mer synthesized polypeptide. The high binding affinity epitope of this mAb was investigated using the Raybiotech Peptide Array-Based Epitope Mapping Service. To map this 28-mer peptide sequence, 11 peptides (8-mer length, 2-mer offset) were synthesized and printed in triplicate on glass slides. The peptide arrays were then probed with the mAb at different dilutions (1:200, 1:400, and 1:800). The results show that Peptide #8 has significant binding activity with the mAb, indicating that the antigen epitope is located within Peptide #8 (Figure 3 and Table 1, below). Figure 3. Peptide array images show the powerful epitope detection using RayBiotech Peptide Array-Based Epitope Mapping Service. All target peptides were printed in triplicate. 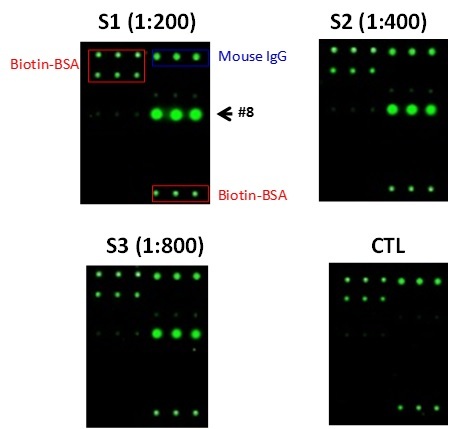 Biotin-BSA and mouse IgG were printed and used as positive controls. Arrays S1, S2, and S3 were incubated with the mAb at 200, 400, and 800-fold dilutions, respectively. CTL array was incubated without the mAb. Peptide #8 is indicated with an arrow in array S1. Table 1. Fluorescence signal of the peptide array probed with the mAb. 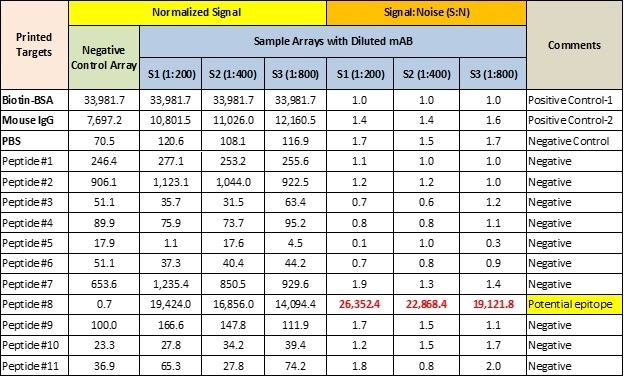 Array signals without mAb incubation were considered to be background. Of the 11 peptides, Peptide #8 had the strongest signal, which significantly increased with an increase in the mAb antibody concentration. The normalized data is shown on left and the signal to noise (S:N) ratio is shown on the right. We would like to thank Dr. Clemens Duerrschmid (Baylor College of Medicine, Houston, TX) for allowing us to present this data.